Silvia and Felix have chosen the small port town of Lerici – on the Gulf of La Spezia – on the Mediterranean coast for their elopement civil wedding in Italy. The Italian Riviera- or Ligurian coast – is basically the coast of the region Liguria. Liguria is probably one of Italy’s most beautiful and smallest regions. The Italian region Liguria is situated between France’s Côte d’Azur and Tuscany and offers style and Italian flair. The Italian Riviera is famous for it’s exclusive old world atmosphere, blue waters and charming seaside towns. Famous poets such as Lawrence, Hemingway and Shelley fell in love with the Italian Riviera. Famous places on the Italian Riviera are the Cinque Terre, Lerici, Sestri Levante, Genua, the Gulf of Poets as well as San Remo or Rapallo. 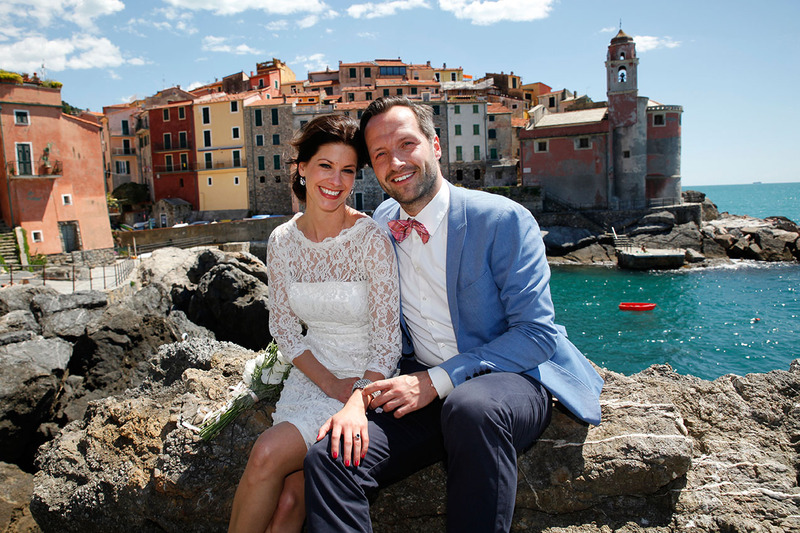 Our insider tip for civil weddings in Liguria on the Italian Riviera is a wedding in Lerici. Lerici is a small port town right on the Ligurian coast in the province of La Spezia on the Italian Riviera di Levante. The picturesque seaside town with colorful houses, a medieval castle, a picturesque harbor and small sandy beaches provides a typical Italian charme. The picturesque medieval castle from 1152 offers an exclusive setting for weddings in Lerici. The Gulf of Poets with small seaside towns such as Lerici or Tellaro offers the ideal setting for a picture perfect destination wedding in Italy with hidden small fishing villages, romantic “trattorias”, pristine beaches and a nature reserve with an impressive variety of typical Mediterranean vegetation. The area around the Gulf of Poets and Lerici are a perfect holiday paradise for hikers, swimmers and an ideal for sailing and snorkeling. Lerici and the Gulf of Poetes provide the ideal frame for an unforgettable wedding in Italy combined with a relaxing holiday. Major airports are Genua, Milan and the airports of the Tuscan towns Pisa and Florence.